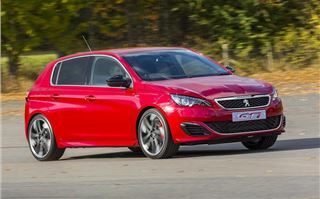 A new Peugeot hot hatch. 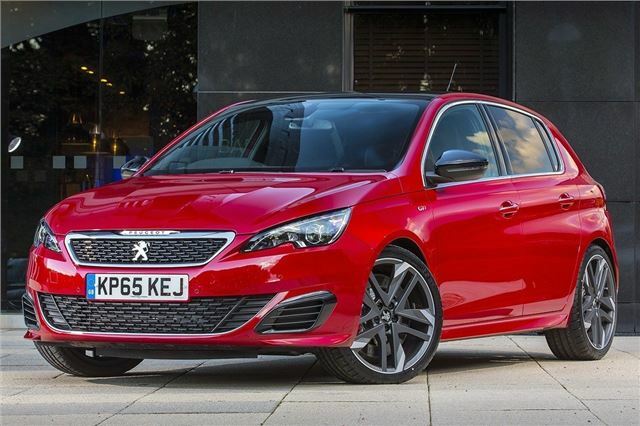 Once upon a time that would be exciting news, but in the 2000s the French car maker lost its form with far from impressive 'hot' hatches like the 307 GTi. 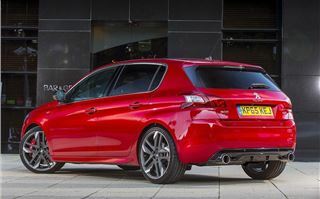 Thankfully, the 308 GTi is based on the best new Peugeot for years and it has some impressive performance figures too. Could it be a better everyday performance car than the Volkswagen Golf GTI? Power comes from a 1.6-litre turbocharged petrol engine, with either 250PS or 270PS. The more powerful model benefits from uprated brakes, larger alloy wheels and a Torsen differential designed to improve traction out of tight bends, plus it’s slightly faster from 0-62mph (6.0 seconds versus 6.2 seconds). These extras might be worth it for trackday lovers, but the 250PS version is all most drivers will need. Peak torque is the same 330Nm regardless of the power output, though the 270 model has a slightly wider torque spread. In practice, on the road, it’s hard to tell the difference - both the 250 and 270 provide serious pace, giving excellent overtaking ability and a very impressive blend of everyday usability and handling prowess. However the 250’s slightly smaller alloy wheels give a touch more compliance on broken surfaces. The suspension set up isn’t overly firm, so potholes and speed bumps aren’t uncomfortable, yet body roll is kept at bay. The steering is precise and well-weighted plus there is a huge amount of front grip, which all adds up to a thoroughly enjoyable drive on British back roads, regardless of how lumpy, bumpy and uneven they are. There’s a sport button in the cabin that turns the dials red, pipes more intake sound into the cabin and sharpens up the throttle response, all adding a little more to the already enjoyable experience. 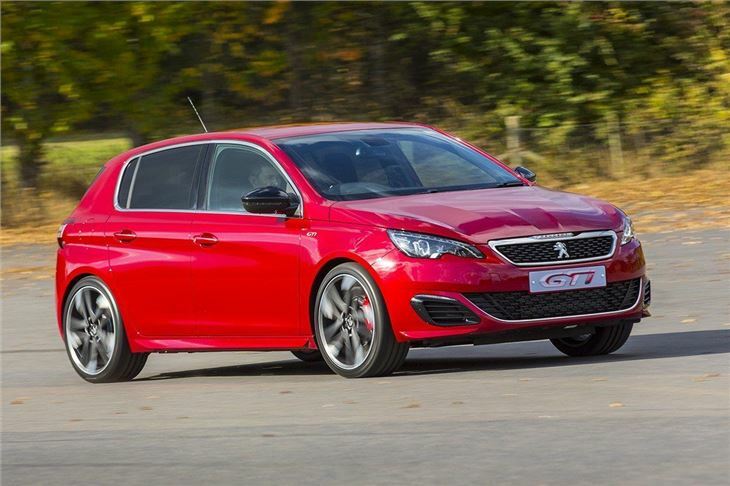 The only criticism that you can level at the 308 GTi is that the steering can sometimes feel a little numb and lacking when it comes to feedback. Some drivers might not like the tiny steering wheel either, but these are minor problems. 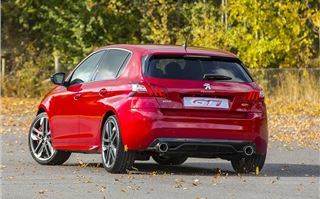 Once playtime is over and sport mode is switched off the 308 GTi is still good to drive. 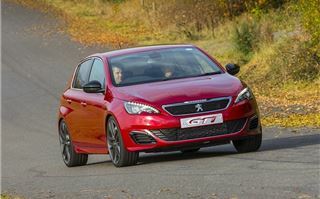 The gearbox is slick, refinement is good and the low down torque makes town and motorway driving easy. Official economy is 47.1mpg, while CO2 emissions are 139g/km, so VED is affordable for such a high performance car and fuel bills shouldn’t be too steep in everyday driving. The cabin is as neat and classy as in the regular 308, with high-quality materials and a handsome, clutter-free centre stack. This is dominated by a touchscreen system with controls for everything – navigation, air conditioning, audio and phone. This works fine in theory, but in practice it would be nice to have separate temperature and fan controls, since they’re easier to operate quickly on the go. 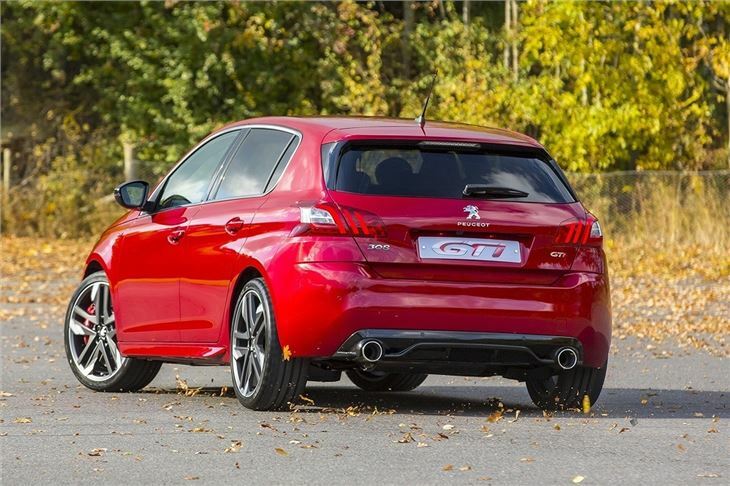 Setting the GTi apart from lesser 308 models is a pair of supportive yet comfortable sports seats up front, plus various red detailing throughout. Despite those few sporty flourishes it’s still very much a sensible, practical family car. 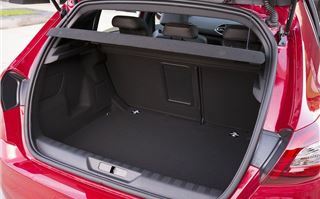 There is a reasonable amount of rear leg and headroom and a wide, low and sizeable boot. 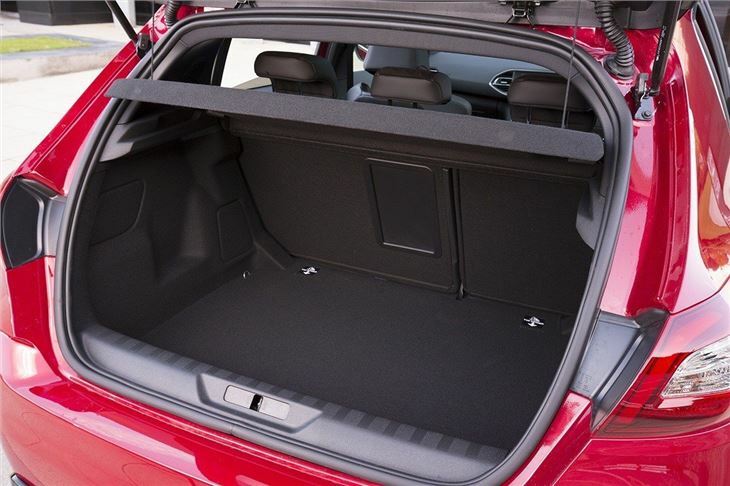 Load capacity is 470 litres or 1309 litres to the roof with the rear seats folded. 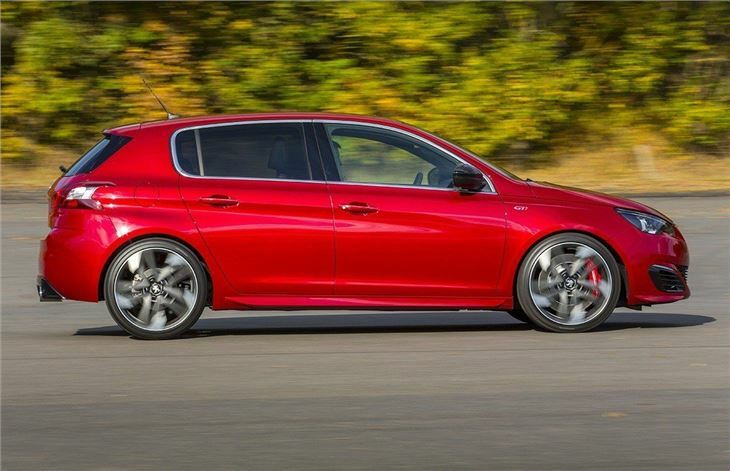 Aside from the interior tweaks, the 308 GTi gets its own alloy wheel designs and a few styling flourishes, but Peugeot has been fairly subtle with the looks, especially when compared to something like the wild, wide and winged Honda Civic Type R. The 270PS 308 GTi does look a little tougher thanks to the giant, red-painted brake calipers, but it’s still subdued for a hot hatch. Standard equipment includes full LED headlights, 18-inch alloys, dual-zone climate control, keyless start, auto lights, auto wipers, DAB radio, navigation and Bluetooth connectivity. The 270PS model gets the aforementioned larger 19-inch alloy wheels, differential and brakes, plus more supportive bucket seats. The higher-powered 270 variant costs £28,155 and for most drivers the extra equipment is only good for bragging rights and track days. There are also some more performance-focused hot hatches, including the Renaultsport Megane, available for a similar price. Our advice is to forgo the big brakes and power hike and stick to the 250. At £26,555 the 250PS model is priced to compete with the lower-powered Volkswagen Golf GTI and the Ford Focus ST – and it’s a worthy rival for both. 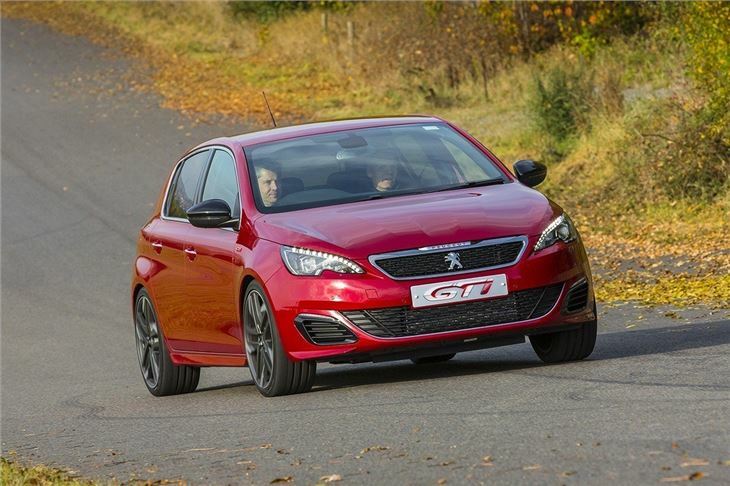 The Golf might be a little better when it comes to fit and finish and the Focus ST can be bought for less money, but the 308 GTi has a great and appealing blend of usability and performance. 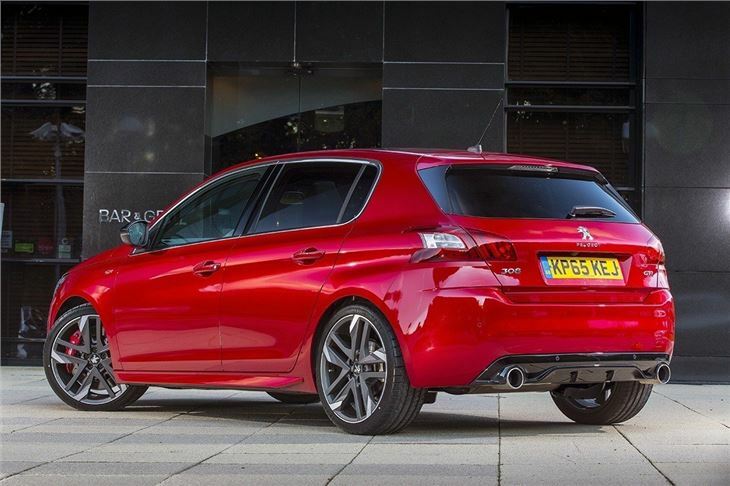 Peugeot has rediscovered its hot hatch flair it seems.